Let half of the distance travelled be d.
Therefore, total time = (d/4) + (d/5) = 9 hrs. 2. A person rides a bicycle round a circular path of radius 50 m. The radius of the wheel of the bicycle is 50 cm. The cycle comes to the starting point for the first time in 1 hour. What is the number of revolutions of the wheel in 15 minutes? 3. Kartik rides a bicycle 8 km/hr and reaches his school 2.5 minutes late. The next day he increases his speed to 10 km/hr and reaches the school 5 minutes early. How far is the school from his house? Let the total distance be d km. We have speed = 8km/hr and 10km/hr. 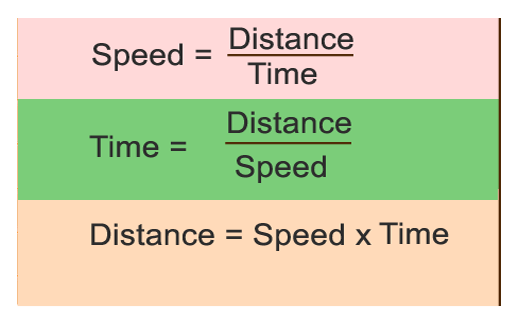 We know, time (t) = distance (d)/speed (s). 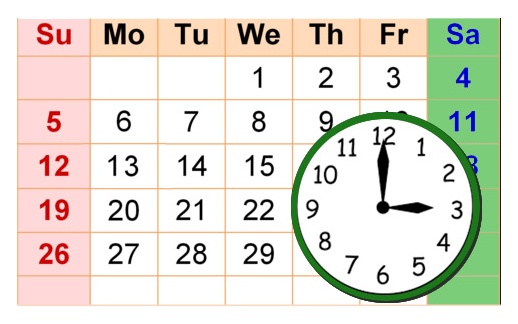 Difference between the time taken on first day and second day is 2.5 + 5 = 7.5 mins. ⇒ d = (75 x 80)/1200. ⇒ d = 5 kms. Therefore, the distance between his school and house 5 km. 4. Virat travelled 75 kms in 7 hours. He went some distance at the rate of 12 km/hr and the rest at 10 km/hr. How far did he travel at the rate of 12 km/hr? Therefore, the distance travelled at the rate of 12 km/hr = 30km. 5. Sanu travelled a distance of 20 kms at the speed of 5 km/hr, he reached 40 minutes late. If he had walked at the speed of 8 km/hr, how early from fixed time will he reach? Time taken to travel 20 kms at the speed of 5 kmph. ⇒ t = 20/5 = 4 hrs. Time taken to travel 20 kms at the speed of 8 kmph. 200 mins – 150 mins = 50 mins. Sanu would have reached 50 mins earlier. Average speed is represented by total distance divided by the time taken. Average speed = 22/(244/120) = 10.8 kmph. Average speed for the entire trip is 10.8 kmph. 7. An athlete runs half of the distance at the speed of 10 km/hr and remaining 15 km at the speed of 20 km/hr, how much time will be taken to cover the total distance? Time taken to cover the total distance is 135 mins. 8. A person travelled by train for 1 hour at a speed of 50 kmph. He then travelled by a taxi for 30 minutes at a speed of 32 kmph to complete his journey. What is the average speed at which he travelled during the journey? = 66/(3/2) = 44 kmph. Let the speeds of A and B be 3 kmph and 4 kmph. 11. A man cycles with a speed of 10 kmph and reaches his office at 1 p.m. However, when he cycles with a speed of 15 kmph, he reaches his office at 11 a.m. At what speed should he cycle so that he reaches his office at 12 noon? ∴ he takes 60/10 = 6 hrs when he travels at 10 kmph i.e. he starts at 7 a.m.
13. A car driver leaves Bangalore at 8.30 A.M. and expects to reach a place 300 km from Bangalore at 12.30 P.M. At 10.30 he finds that he has covered only 40% of the distance. By how much he has to increase the speed of the car in order to keep up his schedule ? 14. A man is walking at a speed of 10 kmph. After every km, he takes a rest for 5 min. How much time will he take to cover a distance of 5 km? and at 12 kmph he takes 7 hours both of which are at a difference of 5. 16. Two cars A and B start simultaneously from a certain place at the speed of 30 km/hr and 45 km/hr respectively. The car B reaches the destination 2 hours earlier than A. What is the distance between the starting point and destination?